Looking to hire or buy a marquee in or around Norwich? Our marquees make the perfect addition to any event. Are you looking for Marquees to buy or hire in Norwich? Does your Norwich venue need a permanent or semi-permanent Marquee? Where’s the best place to get a Marquee in Norwich? At Weatherill Brothers we have been manufacturing Marquees since the 1950’s, and we’ve been based in Norfolk since 1981. During this time our family business has thrived, producing top quality products in heavy duty PVC and traditional canvas from our custom designed workshops in Watton. We are open from 7am, so if you’re looking for a Marquee in Norfolk call us on 01953 882 394 and tell us what you need. We’ve based our business on strong customer relationships. We want your business to grow, and we can help you do that by designing and installing the perfect permanent Marquee at your Hotel or venue, or by providing you with a beautiful hire Marquee that suits your current needs and requirements. Weatherill Brothers are members of MUTA, the UK trade association that works to improve standards in the Marquees, tents, and structures industry. Our Marquees are some of the only ones in the UK to be wind tested and deemed safe at wind speeds of up to 80mph. 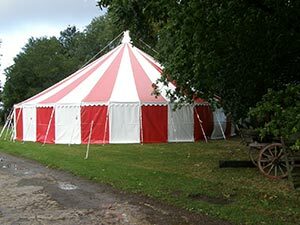 Our traditional Canvas Marquees are constructed by our craftsmen out of high quality breathable cotton canvas, and are elegant and timeless in their design. State of the art PVC is also used to manufacture Marquees in the ‘Traditional Style’ giving a sleek uniform look, and a very robust and durable finish. Other designs such as Bedouin style Marquees can also be designed and manufactured to your specifications. So if you’d like to choose a marquee company that works with you, call us now on 01953 882 394 and tell us what you need.